The eighth in a series of articles about priesthood quorums and their purposes. In the course of organizing His Church, Jesus “went out into a mountain to pray, and continued all night in prayer to God. “And when it was day, he called unto him his disciples: and of them he chose twelve, whom also he named apostles.”1 They were called from the ordinary paths of life. Peter was the first called, and the Lord said to him, “I will give unto thee the keys of the kingdom of heaven: and whatsoever thou shalt bind on earth shall be bound in heaven: and whatsoever thou shalt loose on earth shall be loosed in heaven.”2 This same sacred authority is inherent in the ordination of every Apostle. And so it was; instead of unity of faith, there came division and disunity. It was in this circumstance that young Joseph Smith prayed to know which of all the churches was true and which he should join. Some suppose that the organization was handed to the Prophet Joseph Smith like a set of plans and specifications for a building, with all of the details known at the beginning. But it did not come that way. Rather, it came a piece at a time as the Brethren were ready and as they inquired of God. The First Presidency was in place by 1833; then two years later, in February of 1835, came the Quorum of the Twelve Apostles. And that is as it should be. The First Presidency came first in sequence and stands first in authority. And, true to the pattern, it was made of men called from the ordinary pursuits of life. With the First Presidency and the Quorum of the Twelve in place, with the offices of the Seventy and the Presiding Bishopric revealed, the proper order of things prevails. But there is a difference. It took a generation of asking and receiving before the order of things as we know it today was firmly in place. Each move to perfect that order has come about in response to a need and in answer to prayer. And that process continues in our day. From Nephi we know that “angels speak by the power of the Holy Ghost.”16 Mormon told us that “the office of their ministry is to call men unto repentance, and to fulfil and to do the work of the covenants of the Father, which he hath made unto the children of men, to prepare the way among the children of men.” Mormon further explained that angels accomplish their ministry “by declaring the word of Christ unto the chosen vessels of the Lord, that they may bear testimony of him. 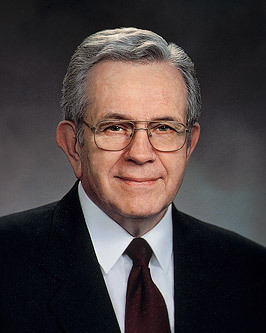 President Harold B. Lee told me once of a conversation he had with Elder Charles A. Callis of the Quorum of the Twelve. Brother Callis had remarked that the gift of discernment was an awesome burden to carry. To see clearly what is ahead and yet find members slow to respond or resistant to counsel or even rejecting the witness of the apostles and prophets brings deep sorrow. Some few within the Church, openly or perhaps far worse, in the darkness of anonymity, reproach their leaders in the wards and stakes and in the Church, seeking to make them “an offender for a word,”22 as Isaiah said. To them the Lord said: “Cursed are all those that shall lift up the heel against mine anointed, saith the Lord, and cry they have sinned when they have not sinned … but have done that which was meet in mine eyes, and which I commanded them. “… Because they have offended my little ones they shall be severed from the ordinances of mine house. “Their basket shall not be full, their houses and their barns shall perish, and they themselves shall be despised by those that flattered them. While each feels his own limitation, there is strength in unity. Never in the history of the Church have the Brethren of the Presidency and the Twelve been more united. Each week we meet together in the temple. We open the meeting by kneeling in prayer, and we close with prayer. Every prayer is offered in the spirit of submission and obedience to Him who called us and whose servants and witnesses we are. The Lord requires that “every decision made by either of these quorums must be by the unanimous voice of the same” and that “the decisions of these quorums … are to be made in all righteousness, in holiness, and lowliness of heart, meekness and long suffering, and in faith, and virtue, and knowledge, temperance, patience, godliness, brotherly kindness and charity.”26 This we earnestly strive to do. We know that we hold the power of the priesthood “in connection with all those who have received a dispensation at any time from the beginning of the creation.”27 We think of those who have preceded us in these sacred offices, and at times we feel their presence. Remember this promise; hold onto it. It should be a great comfort to those struggling to keep a family together in a society increasingly indifferent to, and even hostile toward, those standards which are essential to a happy family. The most precious thing we have to give is our witness of the Lord, our testimony of Jesus Christ. I certify to you that the 14 men with whom I share the ordination are indeed Apostles. In declaring this, I say no more than the Lord has taught, no more than may be revealed to anyone who seeks with a sincere heart and real intent for an individual witness of the Spirit. These men are true servants of the Lord; give heed to their counsel. So, too, with the Seventy, who as especial witnesses carry an apostolic responsibility, and the Bishopric, worthy men of God. So, too, with the brethren and sisters across the world who are called to lead, who have earned that knowledge precious above all else. There are limits to what the Spirit permits us to say.34 And so I close with my witness, my special witness, that Jesus is the Christ, that through a prophet-president He presides over this, “the only true and living church upon the face of the whole earth.”35 In the name of Jesus Christ, amen. “The keys of the eternal priesthood, which is after the order of the Son of God, is comprehended by being an apostle. All the priesthood, all the keys, all the gifts, all the endowments and everything preparatory to entering back into the presence of the Father and of the Son, is composed of, circumscribed by, or I might say incorporated within the circumference of the apostleship.” President Brigham Young (1801–77), Teachings of Presidents of the Church: Brigham Young (1997), 138.